Yesterday, Vince Streano, David Wertz and I revisited the top of the west tower. It was almost 1 year ago (July 21, 2004) that David and I visited the top of the west tower - at that time looking at a number of bridge engineering issues. Among them was the cabling process managed by Olivier Forget from Freyssinet - and the time was near the end of "le Tour de France". 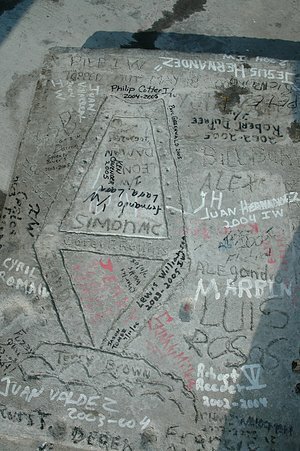 During an earlier visit to the top of the west tower, I noticed a concrete tablet on the floor (upper left) with the names of many of the construction workers. Dumb Frank did not record this photographically at the time. This time I was not going to repeat the same mistake twice. Not only did I take several photos of the tablet, but I found Philip Cotter's and Lewis Williamson's names on the tablet. Philip and Lewis are iron workers, a very special breed of man that suspended themselves while erecting edge and floor girders and placing the concrete floor panels. Philip's wife, Tina, exchanged a number of emails with me about Philip and his artistic and literary skill - naming the last main-span crane (east side) the "Last Dinosaur Standing" (see for the dinosaur story). Here, permanently placed on the top of the west tower is a symbol of the worker's bride. Many signatures are absent - but the pride runs all the way from Bobby Clair through Wade, Peo, Marvin, David and Olivier all the way to me - as these folks opened doors that enabled me to bring to you much of the untold stories behind building our Arthur Ravenel Jr. Bridge. And a final note about the Internet and learning. The Internet provided me a medium that enabled me to share with you what the bridge folks shared with me. Not only that, the Internet provided a communication medium that linked me with Bill Mankin at High Steel, with engineers at the Federal Highway Administration, Bridge Division, with Buckland and Taylor, T. Y. Lin, HDR, Freyssinet and Tidewater Skanska. Governor Sanford and Bob O'Brien even provided input. In the end, Bob has suggested that I explore transfering this web site to the Historical Society or the Library - a wonderful strategy for breathing new life into these pages. So from me - smiles and a big thank you to all of you! Frank Starmer, Medical University of South Carolina.